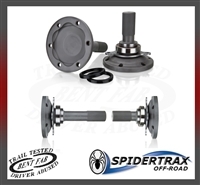 Spidertrax has been dedicated to finding unique solutions to issues faced by off-road enthusiasts just like you. Rather than just making a product thicker and heavier, Spidertrax focuses at the cause of a failure, finding a way to make a better product with minimal compromises. 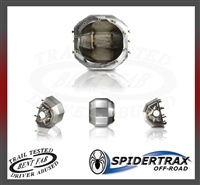 Heat treating, larger diameter axle tubes without increasing tubing thickness, and keyed steering arms are just a few innovations that Spidertrax has applied to their Spider 9 product line. Spidertrax prides themselves on manufacturing products in-house in their Colorado facility, which allows them to provide the best quality control processes in the industry. Need a custom set up for your rock crawler, rock bouncer, or off-road racing rig email us.